How is the weather affecting the oil spill cleanup in the Gulf of Mexico? As you may have seen, the oil slick in the Gulf resulting from the oil rig explosion in April 2010 has begun spreading throughout parts of the central Gulf and threatens coastal areas and wildlife from Louisiana to Florida. Wind is one of the most critical weather elements that those trying to cleanup the oil spill are most concerned with. As the oil spill occurred fairly near the coast of Louisiana, winds from the south and east may help contain the spread of the oil to areas relatively near the site of the explosion. If winds come from the north or west, this can begin nudging the oil slick ever closer toward coastal regions in Mississippi, Alabama, and Florida. Should oil make its way south and hit the loop current (a type of ribbon-like ocean current that runs thousands of miles), oil may begin making its way to Key West and head out to the Atlantic Ocean, where it has the potential to damage coral reefs, sensitive ocean life, and beaches. 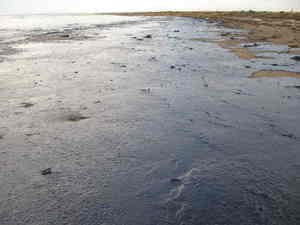 Some scientists now believe the oil spill effects could reach the coastline of the Mid-Atlantic states. At least that’s what their computer models are suggesting. Remember, the diagram in the video below is not a forecast — it’s simply a look at where the oil might go if the water currents play out like the computer model suggests. Of course, the weather has a lot of say in where the oil is going to go, and any hurricanes, tropical storms, or tropical depressions that form and move toward the United States could vastly impact where the oil actually goes. However, the unfortunate news is that, if the water currents remain as they are, we could see oil hitting the eastern United States beaches in no time!